يقع فندق Lake Jindabyne Hotel، المصمم ليناسب كل الضيوف سواء كانوا من رجال الأعمال أو السياح، في مكان ممتاز في أحد أكثر المناطق تفضيلاً في جندابيني. يمكن من هنا للضيوف الاستمتاع بسهولة الوصول إلى كل ما تقدمه هذه المدينة النابضة بالحياة. يوفر الفندق بفضل موقعة الجيد وصولاً سهلاً إلى أهم معالم المدينة.
. إن Lake Jindabyne Hotel حريص على توفير الراحة للنزلاء، فلا يوفر الموظفون جهداً في تقديم أفضل الخدمات وضمان حسن الاستقبال. هذه بعض الخدمات الموجودة في هذا الفندق: واي فاي مجاني في جميع الغرف, خدمة غسيل ذاتية, تخزين الأمتعة, واي فاي في المناطق العامة, صف السيارات. تتضمن كل غرف النزلاء وسائل الراحة والتسلية المصممة خصيصاً لضمان الراحة القصوى للضيوف. يمكنك الاستمتاع بالأجواء المريحة التي تقدمها مركز للياقة البدنية, التزلج على الجليد, ملعب للأطفال, بلياردو, حديقة طوال النهار. يحظى فندق Lake Jindabyne Hotel بموقع ممتاز وخدمات يصعب منافستها. Great location, just near the shops. Clean, warm and modern rooms, private bathroom, nice view and free breakfast. Not much more to ask for! Only minor downside, doors rattle in the wind but nothing to fuss about. Definitely recommended. Location was great, beautiful outlook onto Lake. Hotel room was very basic. Has a Pub right above it that plays music till late so don't expect an early night if you are heading up to the snow early. Room walls are thin and can hear everything your lovely neighbors will be saying!!! Updated and clean. Perfect for 2 couples with separate shower and toilet. Good location and nice staff!!! Rooms are clean and comfortable. No ventilation in bathroom which would be ideal. Reception staff not so warm and welcoming but will definitely stay again!! 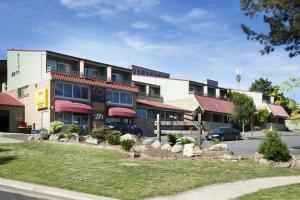 We have stayed for two nights at Lake Jindabyne Hotel, we love the location and easy to find restaurants surround. The view of Lake Jindabyne is excellent. Will come back again! G8 location in the heart of Jindabyne and close to snowy mountains. Terrific views. Overlooking the lake & a simple but tasty buffet breakfast included in the price. Will definitely stay again. Fantastic - great staff, views , facilities and rooms with a view. Bistro and pub onsite - so after a day's hiking perfect place to go back to. Couldn't have been more happy with the hotel, or the price! The hotel offers a good river view. We go to the backyard for a walk in the morning. The view is excellent. 5 minutes walk to the surrounding shops for breakfast. The location is very convenient, next to Woolies! The room is spacious and the view can't be more spectacular. You can enjoy a morning sip of coffee right in front of your room looking towards Lake Jindabyne!